Think about your garage door. What does yours do to protect and insulate your home? If you’re drawing a blank, we have a solution. Allow us to introduce you to the hardest working door on the market. Not only can you increase your curb appeal, but you can save thousands on energy costs! Window World Garage Doors are insulated, which allows your internal temperature to stay exactly where you want in. 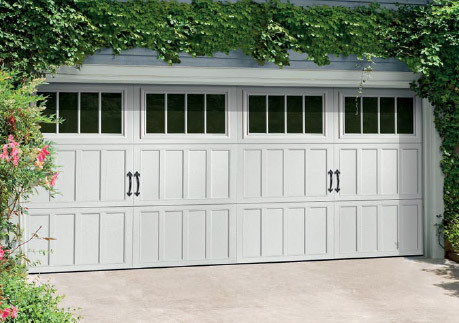 All replacement garage doors come in an array of styles, giving you the option to customize your home’s exterior. What do you see when you look at this picture? Craftsmanship? Custom beauty? We see all of that and more. Made from steel, The Classica Collection of Carriage House Doors have the gorgeous appearance of wood, but will stand up strong to all elements and will require minimal maintenance. With so many options to choose from, you can take customization to the next level. Select from our decorative hardware, reminiscent of authentic hardware found on original carriage houses, which will add instant charm to your door. Love the idea of giving your home extra character? Choose from our Amarr’s Oak Summit Collection for steel doors offer an attractive carriage house look. Doors come in an array of colors, window accents and hardware. Looking for a classic replacement garage door to match the timeless beauty of your home. The Heritage Collection provides 4 different panel designs to choose from, made from a heavy gauge steel, which will give you long lasting durability. When you combine design and efficiency, you get the Designer’s Choice and Olympus doors popular models. With triple-layer construction, a thermal seal, and superior insulation with an R-value of 19.40 or 14.46, these durable, low-maintenance doors give you the ultimate in quiet operation and energy efficiency.